People unfamiliar with the Midwest have visions of vast plains filled with sunflowers, tumbleweeds, and tall grass. While Kansas may have more acreage of fields than many other states, people from the Sunflower State will tell you that there aren’t as many as there use to be. Today, less than 4% of the original 170 million acres of tallgrass in North America remains. It was developed and plowed under in less than a single generation. The majority of this prairie is in the Kansas Flint Hills. 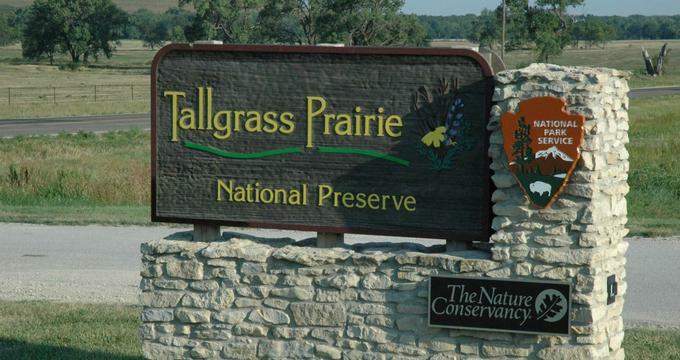 Tallgrass Prairie is a preserve that protects what remains of the nationally significant Kansas tallgrass prairies and their cultural resources. With almost 11,000 acres to explore, visitors can take a bus tour, hike, or use a self-guided cell phone tour to learn more about the Kansas Tallgrass Prairie. Once spanning from Indiana to Kansas and from Canada to Texas, the natural prairie covered more than 170 million acres. Most of it is gone, but this pasture in the Kansas Flint Hills remains. Millions of years ago, the limestone and flint rock formed from a shallow sea of water called the Permian Sea to create the foundation for what is now the Flint Hills, famous in Kansas and named for the flint rock native to the area. This rocky land was nearly impossible to plow but made an excellent grazing pasture. The natural seasons and the prairie life cycle of rejuvenation by fire as well as animal grazing continues to sustain the tallgrass and its diverse animal and plant life today. Hundreds of species of plants, birds, reptiles, amphibians, and mammals call the natural prairie home. Flora and fauna are too small to see from a passing car, but for visitors who stop to take a closer look, a sea of beauty and natural wonder awaits. The Southwind Nature trail starts in front of the Spring Hill Ranch house and winds through the lower prairie, across a tree-lined creek bed, and back up gently rolling hills to vast vistas of breathtaking beauty. Measuring 1 ¾ miles, it’s an easy trail for a short stroll. South from the Spring Hill Ranch House on Highway 177, the first left down a gravel road past the Saint Anthony Cemetery takes visitors to the head of the Bottomland Trail. There are two loops to choose. Neither path is long, and both have benches for relaxation and reflection. Natural and cultural history abound on these paths with interpretive panels and brochures for browsing. This trail is also wheelchair friendly with an available comfort station. Fox Creek Trail winds through Fox Creek for a six-mile round trip hike. Visitors experience a riparian area full of lush greenery. Wildlife sightings are common here among turkey, whitetail deer, and a variety of birds. All trails are open twenty-four hours a day all year long. Learn about bison, the tallgrass prairie, native people, and ranching culture on the daily bus tour. Rangers provide an interpretive program while driving through bison pasture where riders can have up close and personal encounters with herds. Buses are air-conditioned and wheelchair accessible. Tours of the Spring Hill Ranch house and Stock Ranch are self-guided and give visitors a glimpse into the past. They learn what it was like to live on the prairie, raise livestock, and work a full operation ranch in the 1800s. Join Tallgrass Prairie friends for activities that help bring back the monarchs. Monarch butterfly numbers are low, and pollinators are in decline as well. Using herbicides and other chemicals in farming and the ethanol mandate lead to the rapid loss of natural habitats for butterflies and bees, threatening the migration of monarchs and any species dependent on pollinators to provide food like fruits, nuts, seeds, and foliage. Junior Rangers can earn badges by completing activities in the Tallgrass Prairie activity book. Drawing pictures of the prairie, writing essays about what they learned, identifying plants and wildlife, and taking a quiz will test a Junior Ranger’s knowledge of what they learned on their visit. They can also participate in scavenger hunts or paleontologist programs. Nearby Cottonwood Falls boasts restaurants like Ad Astra, with the best burgers around and mac and cheese that rivals anybody’s mom’s recipe. Their small town friendliness compliments big food personality, and is a quaint place to stop in after a long day of hiking, fishing, and exploring. Tallgrass Prairie National Preserve has a lot to offer for nature lovers and history lovers alike. From learning about the history and culture of the prairie to watching wildlife in their natural habitat to getting some exercise in the great outdoors, it’s a beautiful destination for rest, rejuvenation, and exploration.